This is a great quick dinner to dress up a Monday that needs a little oomph. The spaghetti squash can be made ahead, and the rest comes together in 10 minutes or so. This picture is terrible. I blame hunger. Halve your spaghetti squash lengthwise and place face-down in a shallow dish or two bowls. Add a Tablespoon of water to the dish and prick the backs of the squash with a fork a few times. Cover tightly with saran wrap and microwave on High 20 minutes (or until soft). Remove and unwrap to cool. 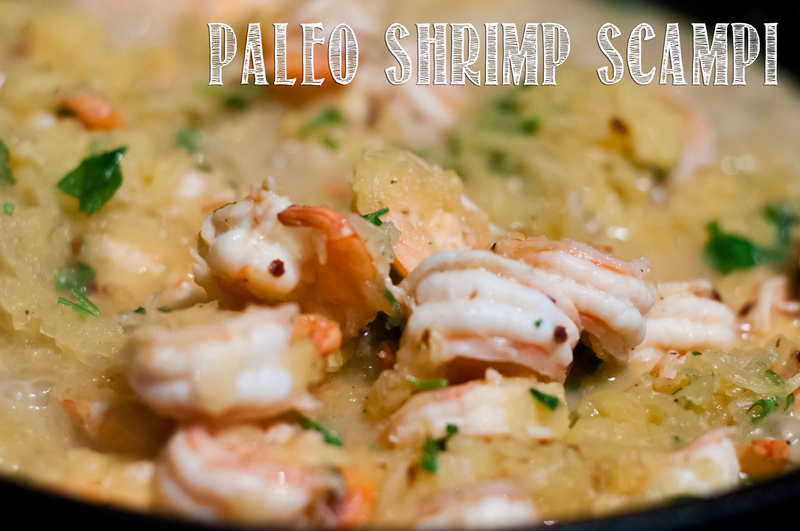 While your squash is cooling, clean and peel the shrimp if you haven’t already; chop the garlic and chop the parsley. Add the butter to a large pan over medium heat and melt. Add the shrimp, a couple big pinches kosher salt, a pinch red pepper flakes and a few grinds black pepper and sautee until just starting to turn pink. Add the lemon juice and stock/wine and keep cooking until the shrimp is pink through and the liquid has reduced a bit. Hit with salt, pepper and red pepper again if needed. When the squash is cool enough to handle, shred with the tines of a fork to form noodles and dump into the pan with the shrimp. Toss to combine. Taste and add more salt/red pepper/black pepper if needed. Add the parsley and toss again. Serve sprinkled with cheese if you are eating cheese.